Historic Landmarks: 46,50 & 62 #46 Selwyn Shaw House, 140 N. Ann Street The William Suyter house is one of three landmarks located in the Selwyn Shaw Historic District. 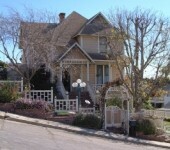 This Queen Anne style residence was built by Selwyn Shaw, prominent Ventura carpenter/builder, in 1890-91 as a rental located on South Oak Street. The house was moved to the Shaw block from its original location at 334 S. Oak Street at the time of the Beachfront Redevelopment. #50 Bert Shaw House, 1141 Poli Street Built in 1896 by Jesse Bert Shaw, the son of Selwyn Shaw and a carpenter/builder like his father, this one-and-a-half story Victorian, with a medium high pitched cross gable roof and plain boxed cornice, is one of several houses built and lived in by members of the Shaw family along the 1100 block of Poli Street. #62 Suyter House, 1157 Poli Street Selwyn Lock Shaw, a prominent carpenter/builder who was responsible for the construction of many local Victorian style residences, as well as the Bard Hospital and Methodist Episcopal Church, built this Queen Anne style house for himself in 1888. This house is one of several on a block of primarily Victorian style houses owned and occupied by members of the Shaw family.